In Vietnam we find many producers of vegetables, flowers and potplants. For these cultures good potting soils are important to achieve the best results. Till now, most producers were making their own substrates: the growers buy the raw materials and mix it themselves together with fertilizer. Other growers are importing a complete potting soil from abroad (which is very expensive). As we all know, the substrate is the start of the culture and therefore it is very important that there are no surprises about the quality. The current raw materials are not really well-secured; the EC and pH is fluctuating, often weeds are found in big quantities, the physical characteristics are unsure and after all the reliability of the end product is doubtable. Langbiang Farms www.langbiangfarm.com.vn (the largest producer of flowers, potplants and vegetables in the Dalat area) decided to invest in a productionplace where pottingsoils can be produced in a professional, safe and reliable way. The raw materials which come in are of the highest quality and the materials are all screened before they are used in mixes. By using a professional mixingline, the customers can trust on a good and safe potting soil which is ready to use. In August 2013 Langbiang Farm asked I.S.C. (Independent Substrate Consulting) from Holland to advise about the raw materials which should be used but also to help improving the mixing. In June 2014 the first bags with professional potting soil were filled. 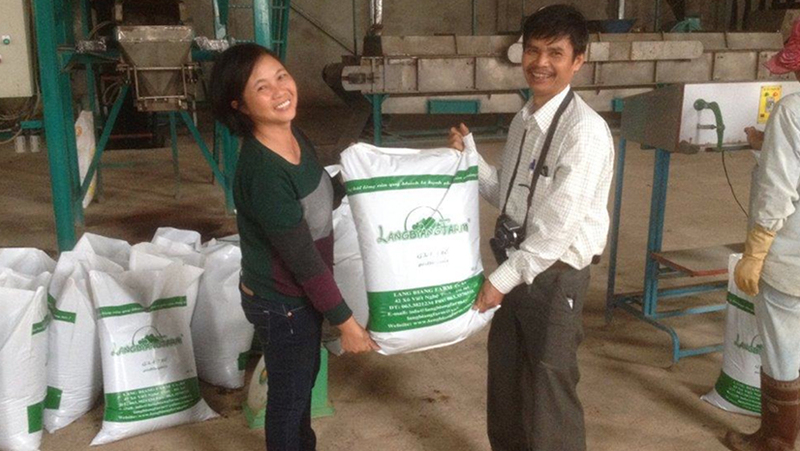 The owners Mr Duong and Mrs Tam are proud to introduce this first professional productionplace for potting soils for the growers in the Dalat area.